Air hockey offers a nice diversion away from video games. With the best air hockey table for kids the entire family can join in the fun. Buying an air hockey table for young children can be a bit problematic. First you need to have it in the right size, so they can reach their side of the playing surface. Kids should be able to handle the pushers nicely, and they shouldn’t have any trouble dealing with the puck returns and the scoring. 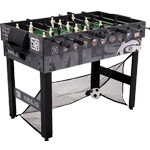 But the best air hockey ﻿﻿﻿﻿tables for kids should consider all these factors and then some.These models offer compact sizes so that they don’t occupy too much space even in a cramped apartment. What’s more, they’re often easy to bring along for visits to the park or to the grandparents. Even the setup shouldn’t take that much time and effort. Of course, the trick is to find this best table. And to help you out, here are some models you may want to look at. 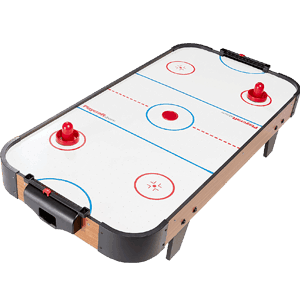 This 40-inch model is a good example of what to look for in the best air hockey table for kids. The size is just right for them to reach around the playing surface. The decorations are simple and non-distracting, and the size of the strikers and the pucks are just right. This is a tabletop model, so you only need to put it on a table to play it. The lack of long legs makes it easier for portability too. Even though it’s marketed for kids, it’s still a proper air hockey playing surface. It doesn’t just rely on a slippery playing field. Instead, it still comes with a motor that pumps in 100 CFM of air over the playing surface. This minimizes the friction and the puck glides effortlessly all over the playing surface. Playcraft is well aware that older kids and their parents can often be tempted to play this with as well. That’s why it’s not made with cheap flimsy materials. They used a sturdy MDF hardwood frame for the table to ensure long lasting fun.While it’s not really standard in size, it’s still a lot of fun for everyone. Generational play can offer bonding moments between parents (or grandparents) and kids. Children can also play against each other directly, which offers a more social setting for children. To minimize the arguments about who’s winning, there are also sliding scoring systems at each end.No doubt this is the best air hockey table for kids. 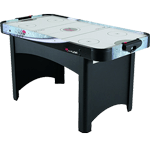 This is the best air hockey table for kids because this air hockey table model is even more affordable, and that’s again because of the compact size. That doesn’t mean it’s too small, however. But its dimensions (40 by 20 by 5 inches) are just small enough for kids, while bigger teens will still find it a lot of fun. Parents will find much to appreciate with this model aside from the alluring price. The size and the 10-pound weight make it very portable, so it’s not a problem to bring along with you for vacations. It’s also easy to move it from one spot to another, while it can fit inside even cramped apartments. You’ll love the fact that it’s cheap, it’s not really made of cheap materials. It’s actually made from high quality wood so it will last for a long time. The fan offers powerful air for smooth playing action, and there’s a manual scoring system that settles arguments about who is winning. Put this on your nice table, and you don’t have to worry about scratches either. It comes with rubber feet to prevent such accidents. 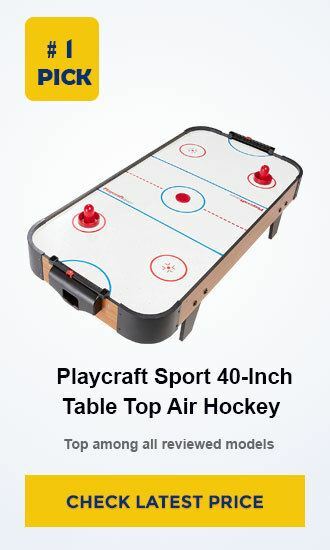 Add the fact that it’s nice and easy to assemble and the air fan isn’t distractingly loud, and you have an air hockey table that kids will take to for long hours of playing. So this is the best air hockey tables for kids no doubt. Now this one isn’t a tabletop model. It’s a proper table with legs, and you’re supposed to just let it stand there in the game room. Don’t worry, as it looks very good. The L-style legs are 3.25 inches wide, and you have aprons on both ends of the table. In fact, it’s downright inviting—and sooner or later the kids will gravitate towards it. It offers a substantial playing field which measures 54 inches long and 27 inches wide. That’s good enough even for younger kids. The sides measure just half in inch high, while the whole table is a little bit more than 30 inches high. It’s made of plastic and MDF material. That makes it light enough so you can easily move it from one spot to another. If the kids can take care of it properly by not abusing the playing surface, then it can last for quite a while. 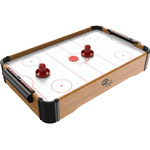 Gameplay can be engrossing, with the air motor offering very smooth sliding for the puck and handles. Just use the handles and pucks that come with it, and don’t replace them with bigger models. There’s a sliding scoring system at each end. This is ultimately just for kids, and very young children will be enthralled by it. At this price point the best air hockey table for kids , it’s a great starting model for children to want to get the bigger tables later as they grow older and bigger. 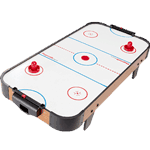 Yes,This is a lucrative another one nice mini tabletop air hockey unit, and the price/individual one is extremely affordable very smoothly no doubt. It’s really like paying for two coffees from your favorite gourmet café. 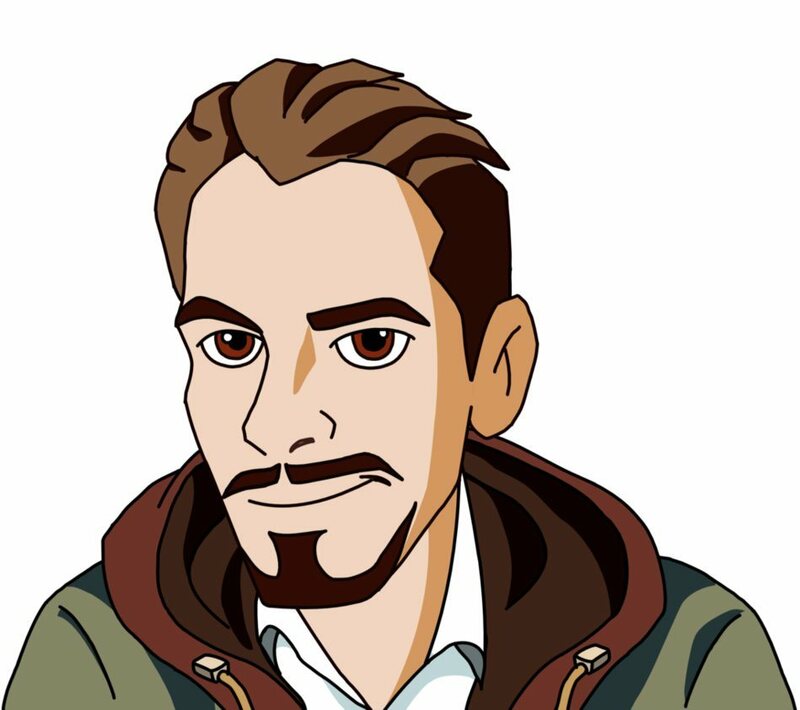 It’s very comfortable as well as lightweight for portability, and compact also. It measures 12 inches wide and 22 inches long and only 4 inches thick. Kids can easy bring it to school, to the near park, and also to the beach for enjoying game. Great options It doesn’t need a power outlet, because as it uses 6 AA batteries only. Look,Just because it’s a mini doesn’t mean that everything’s too small. The pucks measure 1.5 inches in diameter, so you can see it easily enough when you play. And the paddles measure 2 inches so it’s wide enough with play and easy enough to handle for kids and all persons. It's scorekeeping system is also simple and easy enough for everybody, as you just slide the marker to the right score. 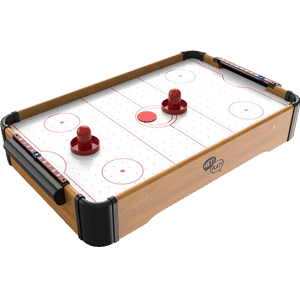 It also offers easy puck return so the game flows constantly enjoyable.With the air motor blowing air over the surface, it offers enjoyable as well remarkable action that even teenagers no doubt (and adults) will like forever. Since it’s very very cheap for buyer, the adults person should just let kids play with it. 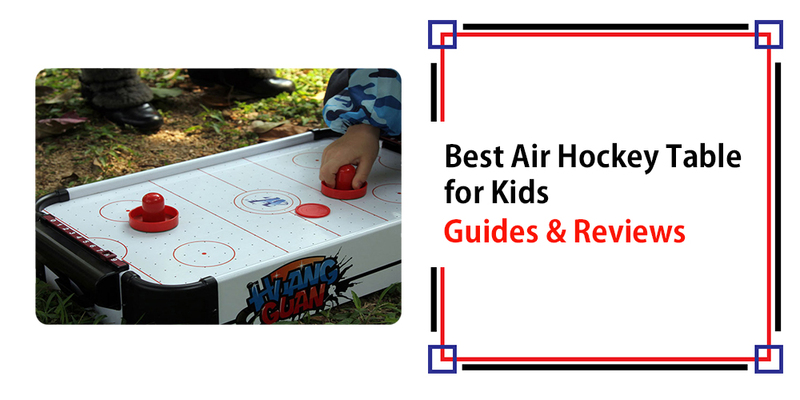 If the bigger kids want to play air hockey, you can get them a more durable/sustainable and bigger/new version of the best tabletop air hockeys. This one is strictly for the tots, and that should let it last for a very long while. When they get older/bigger and they want more air hockey table (and they will), you can get them a bigger and more durable and sustainable version for more enjoy. No doubt kids these days, sometimes 2 classic games aren’t enough for them. Now a days you can make sure that a big group of kids will have a nice and humble selection of games with this type of combo table, as it offers 4(four) games! The space always savings are substantial (not to mention the savings on expenses) since this table is one and only 48 inches long. That means it’s much easier to move from one spot to another spot. The games include multi-pal options that is - table push soccer,soccer/foosball and floor soccer. You will get all the accessories for each individual game and switching from one game to another game isn’t a problem. You just think and remove the current or present tabletop game and put on a new one game.That is why this one the best air hockey table for kids for indoor game World. It’s always nice to have options when you’re playing these games. You make sure you and you don’t get tired of playing just one game, and at the same time you save a lot on expenses and in space with the portable air hockey tables. 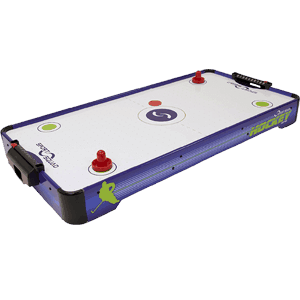 The best air hockey table for kids will depend on your budget and how old the players are, but in general all these games will have kids of all ages (including the adults) clamoring to play when they have free time. 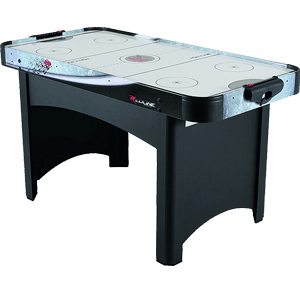 Finally Yes, this is best air hockey table reviews as well as you call it's short name air hockey tables kids.